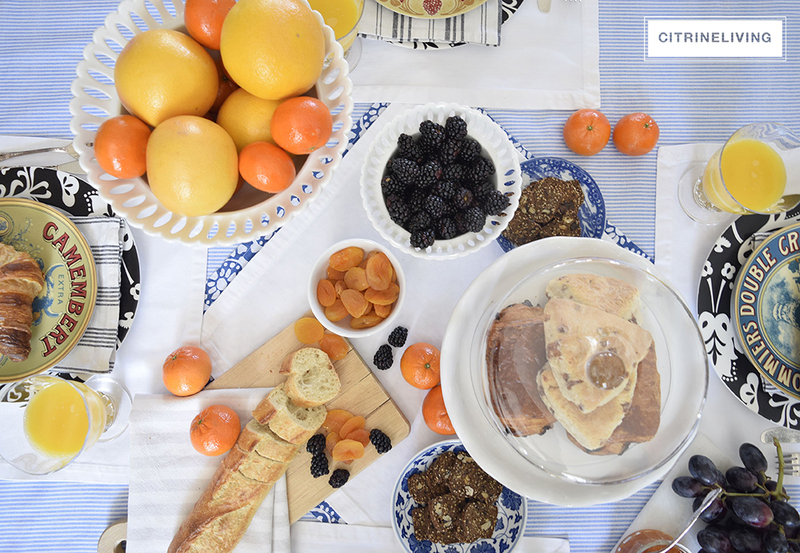 Hi and welcome to my Mother’s Day Brunch post! Thanks for stopping by! 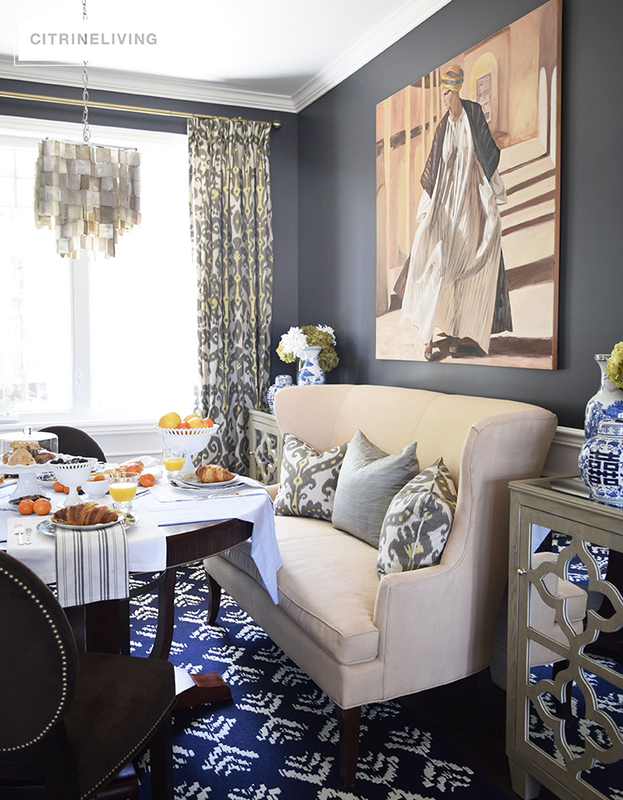 If you’re heading over from Jennifer of Decor Gold Designs, I’m sure you agree that Jennifer’s home and sense of style is simply incredible, isn’t it? 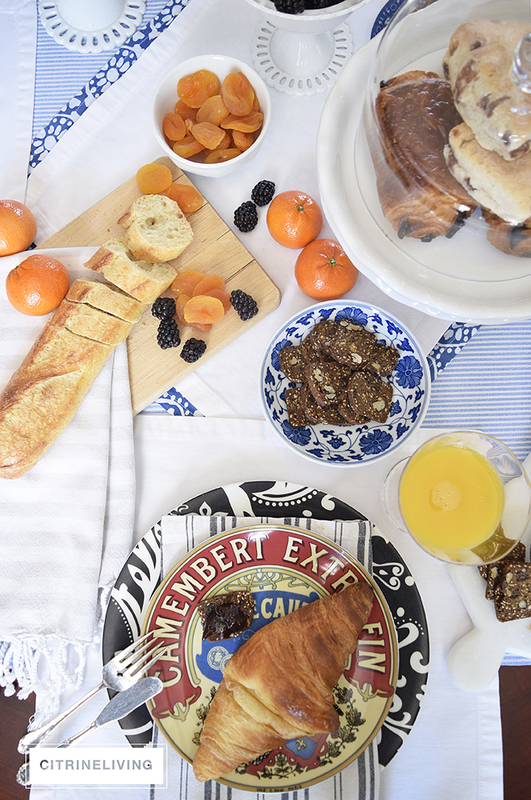 When my good friends Kelley, of Kelley Nan and Randi, of Randi Garrett Design, asked me to participate in their Mother’s Day blog loop, I jumped at the chance and decided a no fuss, easy as 1-2-3 brunch would be my menu of choice. There are 18 of us in this loop – at the bottom of my post you can link to over to anyone of these fabulous bloggers for loads of tablescape and entertaining ideas! When it comes to Mother’s Day, I don’t know about you, but so often we’re running from family to family celebrating the day and before you know it, I have about 5 minutes to enjoy my own day! I wanted to create a table that would be easy and quick to pull together when I am the one entertaining, or when we’re on the go for the day and have only a little time at home. 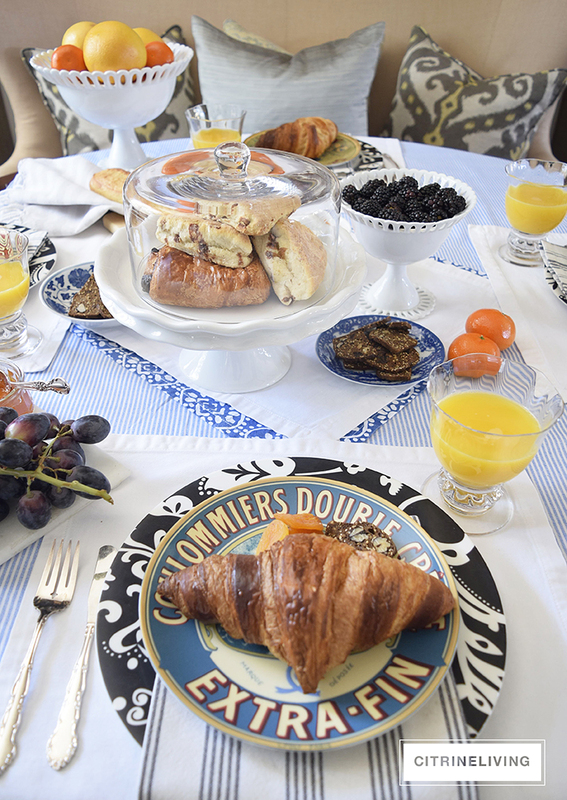 There’s very little prep with this table and nothing could be more delish than fresh baked croissants and fresh fruit. Please come on in and have a seat at my table while I walk you through this simple set up! As for the menu – it cannot get more stress free than this…a mix of croissants, baguette, scones, gourmet crackers, some fresh and dried fruits, fresh juice and some jam spreads. Quick, simple and delicious. With this type of menu, it is so easy to pull together, even at the last minute if needed and your kids could pull this off in no time. That’s the idea behind it – so all the busy mothers get to enjoy a little downtime before heading out to visit our families to celebrate. I wanted this theme to be a somewhat rustic, French country inspired tablescape, so I imagined how I would like to set a table if I were somewhere in the French countryside. Although I do admit – I’m missing the actual Camembert! Funny how the basis of my theme got left in the fridge! I used my assorted French cheese, or ‘fromage’, plates as my starting point and built the rest of the tablescape from there. I love to layer different linens together to create visual interest, so I started with this blue and white striped piece of fabric that I had for the base of the layers. I folded it in half and laid it across the table, as you would a table runner – keeping it casual, I left part of the table exposed. From there, I layered white cotton napkins and used them in lieu of placemats, just another layer – again, easy and casual – no fuss! Using my black and white dishes as chargers under the colorful, French themed cheese plates, as another element to ground my setting, I tied these all together visually with the black and white striped napkins. 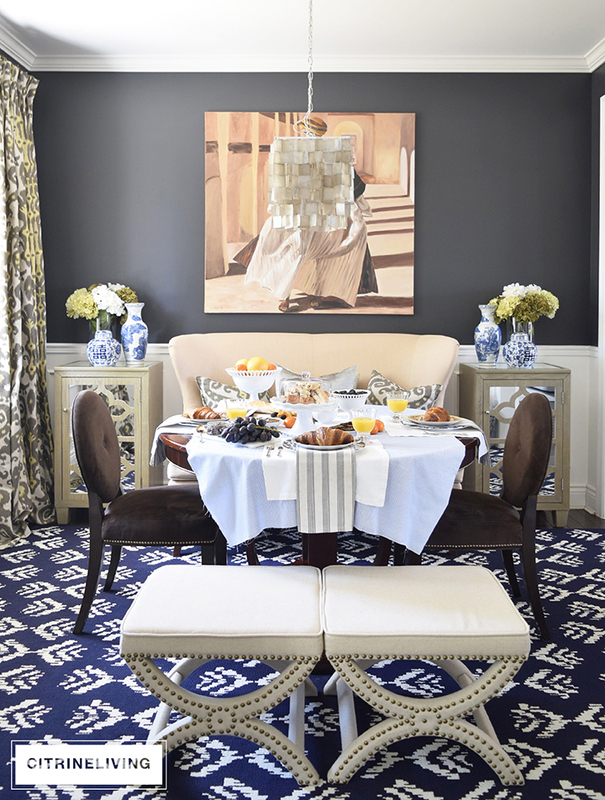 Finally, layering a blue and white printed napkin with a solid white one, I wanted to pull the splashes of blue around the table, into the center – somewhere to draw your eye. 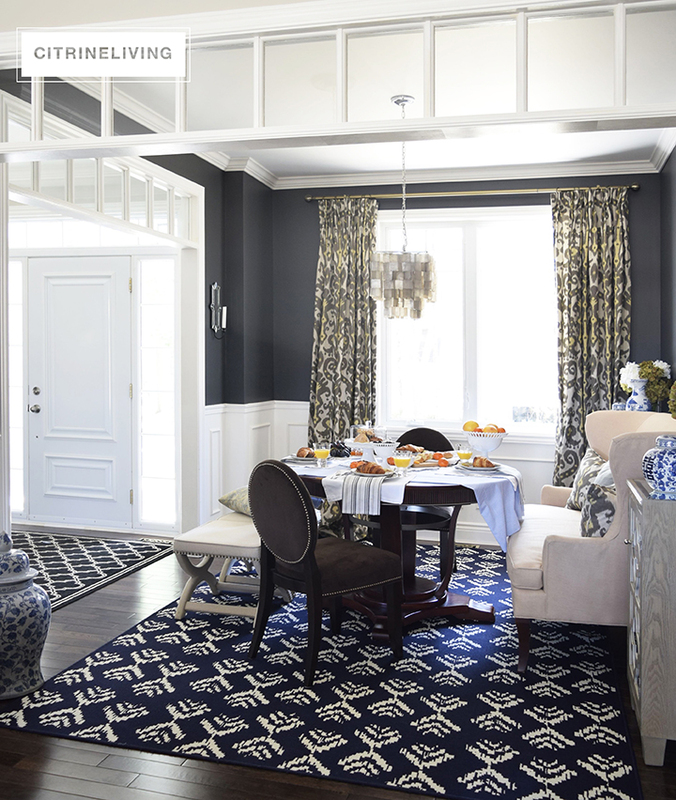 Now let’s take a look at the dining room – you can see how I pulled together my Spring decor and tablescape in this space by clicking HERE. 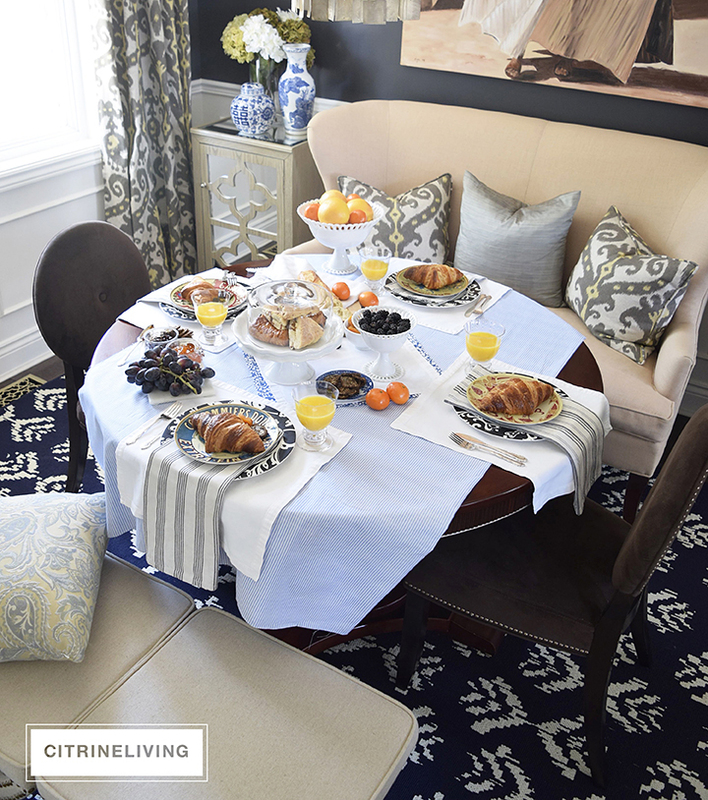 Keeping my blue and whites from Spring was key for this Mother’s Day setting, but having them support, rather than star in the space, was the intention. So I arranged them with my hydrangeas on the side mirrored cabinets to have a pop of color against the black walls. This wall color is Cracked Pepper by Behr Paints. If you’ve been following along with my blog for a while, then you know that I’m looking for a new chandelier as well as vintage Chinese Chippendale chairs for this room. Since we only have the two chairs and settee for now, we often pull up Chinese garden stools for extra, casual seating. I don’t have any shown in this setup and I wanted to mix it up this time, so I brought in my upholstered, x-base stools from the living room. I love to mix different, unexpected things together, rather than using sets. Don’t get me wrong – I love it in other people’s homes! I do like pairs though and you’ll see that a lot in our home! For my personal style, I prefer something more casual – we’re very laid back over here! Mixing different seating is a great way to achieve a casual, collected look. 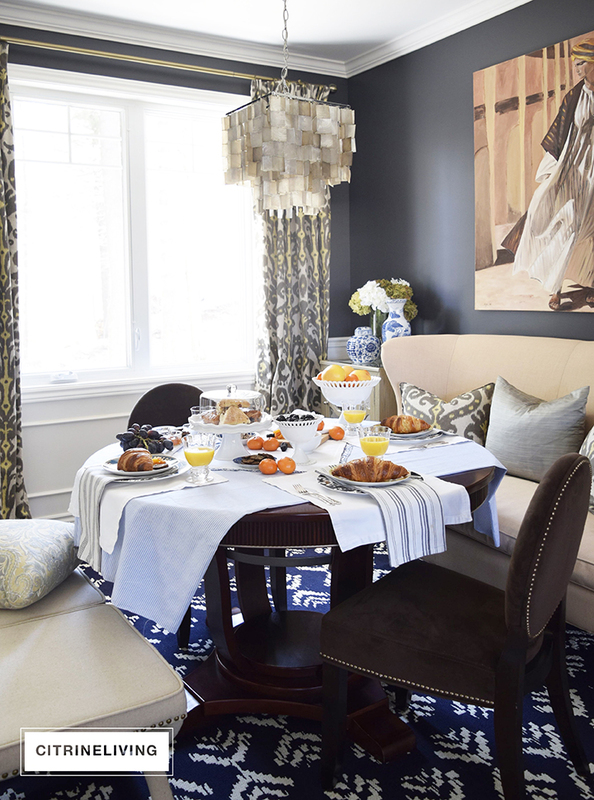 Breaking sets up and using them in different rooms is another way to create a casual feel. Here are a few more shots of this room, to give you a sense of the space within our home. There you have it! This brunch is an easy and elegant way to entertain for guests as well as something fast to enjoy with your family when you don’t have a lot of time! I hope you enjoyed this casual setting and that you’re inspired to create something similar! Next stop on the tour is Jeanne from Jeanne Campana Design – you don’t want to miss out on her fabulous table! Below is the list of all participants in the loop, please be sure to visit them all! I absolutely love this Tam! So beautiful and casual. Love the the how you used the fruit and those fun plates! Simply gorgeous! Tamara, you’re amazing! This is so classy and fun. You nailed it!! No surprise there ;) Love ya, friend! This is such a fun table Tam! 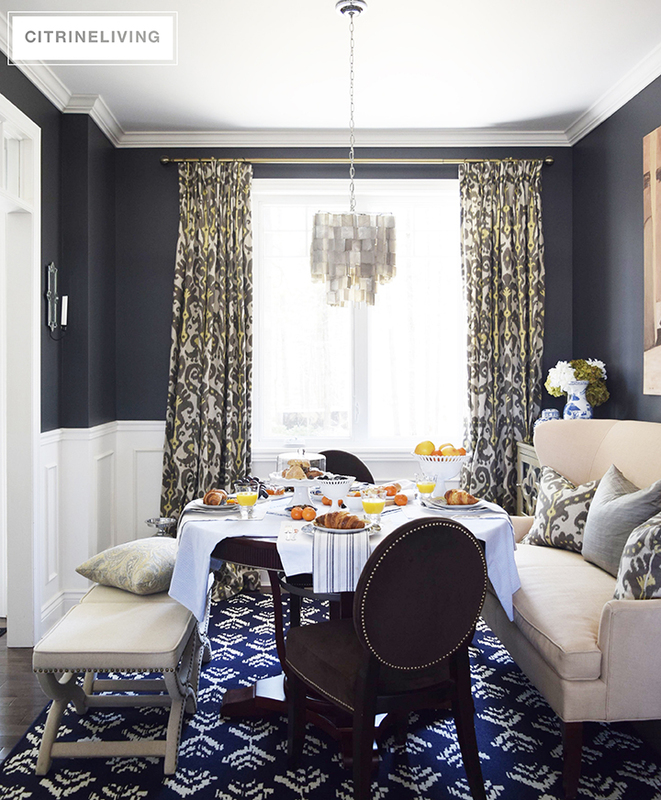 Love how simple and elegant the food is in your amazing dining room! I knew you would create something special, Tamara, and you did not disappoint! Love your casual, fresh table! 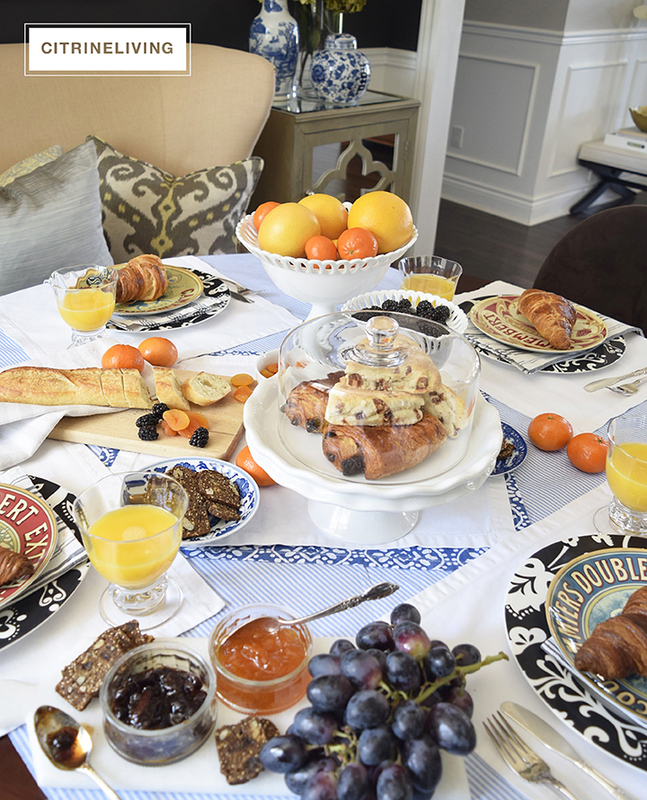 Tamara, you put together the perfect brunch! It goes so beautifully in your gorgeous home! Tam, your table is so creative, so beautiful, and so YOU! Out of the park, my friend! Hi Tamara, I just sat down after a long week of travel, and it is always such a treat to see your beautiful home. I hope you have a wonderful Mothers Day.